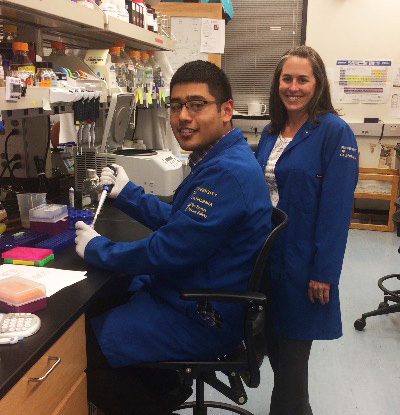 Edmundo Perez working in the lab with Rebecca DuBois, assistant professor of biomolecular engineering. Photo by Karyn Skemp. Edmundo Perez has been fascinated with viruses since his first biology class at Hartnell Community College. In that Introduction to Biology course, he learned about viruses and became intrigued with their structure. He found out about how they multiply and mutate, and how they spread from organism to organism. Now Perez (College 10 ‘17, bioengineering) is being recognized for his work on how the human immune system blocks virus infection and disease. He is this year’s winner of the Steck Family Award, which honors the best senior thesis completed during the academic year, with the winner chosen from the Chancellor's Award candidates. Loren Steck (Porter '73) was part of the distinguished selection committee that chose to recognize Perez’s project. The Steck family created the endowment that funds the award. Perez worked for two years in the Baskin School of Engineering lab of Rebecca DuBois, assistant professor of biomolecular engineering. His research culminated in his thesis, “Structural Studies to Understand Evasion of an Astrovirus serotype-2 subtype to a Potent Neutralizing Antibody.” Dubois, along with biomolecular engineering graduate student Walter Bogdanoff, guided him along the way. DuBois’s research group is dedicated to understanding the molecular mechanisms of virus infections and to use that information to develop vaccines and antiviral therapeutics. Perez’s focus was on the human astrovirus capsid surface protein. His goal was to understand the virus’s atomic structure and its interactions with protective antibodies. The ultimate goal of this research is to create a vaccine for the virus, which causes gastroenteritis, including diarrhea, vomiting, and fever. It most often affects children, but can also affect elderly adults. Perez wanted to find out how a particular antibody could help stop the virus. To do this, he needed to understand the structure of the virus itself, and then try to pinpoint the place where the protective antibody binds with the virus. His research encompassed molecular biology, protein engineering, and X-ray crystallography techniques. Both DuBois and Bogdanoff expected a lot from Perez, and Perez stepped up to the challenge. “Edmundo did an amazing job,” DuBois said. Alexander Wolf, dean of the Baskin School of Engineering, attended the award luncheon. "Edmundo is absolutely deserving of this award and I am extremely impressed with his academic achievements," Wolf said. "We can all learn from his determination, hard work, and ability to overcome life's challenges." Perez found his passion for science during a junior year high school French class. He surprised himself, and his teacher, by excelling in the class. He enjoyed learning the language, and he liked the feeling of success. He began to study more and work harder, which led to better grades. His French teacher noticed the change in Perez and encouraged him to keep working. “Of all my teachers, she was the one who really encouraged me to go to college,” Perez said.